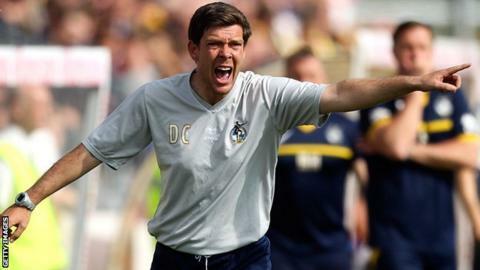 Bristol Rovers manager Darrell Clarke says he cannot understand why some fans are being "negative" towards the club. Rovers dropped out of the Football League in May and are now fourth in the Conference table. But Clarke felt moved to speak out about the atmosphere at the club, after a fan allegedly boarded the team bus to confront players and staff after Tuesday's 0-0 draw at Alfreton. "It feels like it's us against the world," he told BBC Radio Bristol. "When a fan wants to get on a bus at the end of an away draw and wants to have a go at my players, and my assistant is having to calm the fan down, it's a bit of a disgrace. "In the first week of the season, there were 100 posters around the training pitch asking for the manager to be sacked. I had to clear the posters off the training pitch and try not to let if affect me. "God help us when we go on a bad run and lose a couple of games." Clarke was promoted from assistant to first-team manager in March, replacing John Ward with eight games to go of the League Two season. At the time, Rovers were 20th in the table and Clarke was unable to prevent the club from dropping to non-league for the first time in 94 years. The former Salisbury boss rebuilt the Pirates' squad over the summer and, after an indifferent start to the campaign, Rovers went on a nine-game unbeaten run. And Clarke says he does not understand why fans are putting pressure on the team to improve. "The players are down and they can't understand the negativity that's surrounding the place," he continued. "People keep reminding me where Bristol Rovers were five or six years ago and the good players that have played for the club in the past. "But it's difficult out there. The board are doing all they can and I'm working off a budget which is 50% less than what it was last season. People need to wake up and smell the coffee. "I feel the supporters' frustration but we're doing the best we can to get out this league. It's not going to happen overnight. There's not enough pulling together at the moment."